Mexican cinnamon cookies are tender and bursting with flavor. The best part is that they'll fill your house with the delightful scent of cinnamon when you bake them. Once the butter is soft, cream the butter and sugar using your stand mixer. Add 1 ½ teaspoons cinnamon. Continue to beat the mixture. Add the egg yolks, mix to combine. Add the salt to the mixture. Add the flour and beat until combined. Turn the dough out onto your work surface and form into a disk about ½-inch thick. Wrap with plastic wrap and let rest in your refrigerator for at least one hour. 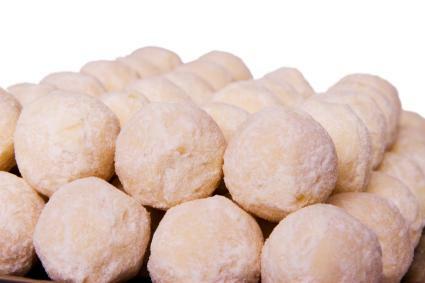 Form the dough into ½-inch balls. Place the dough balls on the lined cookie sheets. Bake until pale golden brown, about 17 minutes. Mix together 2 teaspoons of cinnamon and 1 cup of sugar. When the cookies are cool enough to handle, roll each cookie in the sugar/cinnamon mixture. These cookies are delicious just as they are, but here are a few tips you can try to make them even better. If you like, you can add freshly ground nutmeg or even a dash of ground clove to the coating mixture to make the cookies even spicier. Try adding a dash of cardamom or cocoa powder to the mixture to play with the flavor and, of course, ginger is always welcome during the holidays. The longer the dough rests in the refrigerator, the better these cookies turn out, so you might want to make a batch or two and let the dough rest overnight. These cookies are so delightful that you will likely bake a lot of them because they don't last long once your guests taste them. Bake them just before your guests arrive to infuse your home with a fabulous holiday aroma.